Good afternoon everyone! I hope you all had an amazing weekend! I am finally caught up and can finally share my beach getaway nails. Memorial Day weekend I took a few days to relax, enjoy friends and family, and catch a lot of sun. It was a much needed break and clearly not long enough so I am already counting down to my next weekend of R&R. 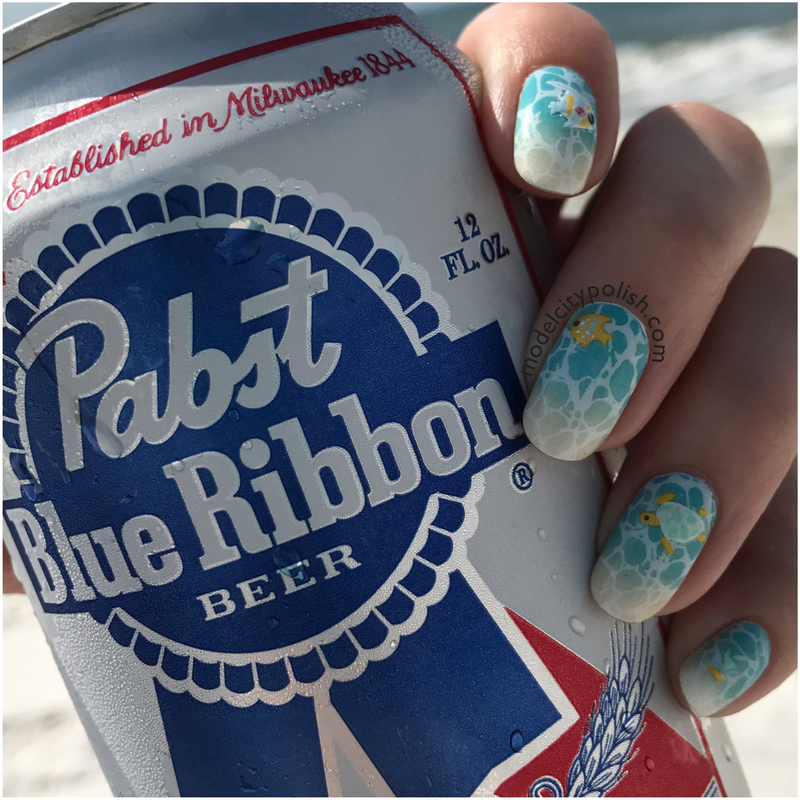 Now while on vacation I had shared a sneak peek on Instagram of my beach nails but today we will take an in-depth look at the beachy look and all used to create this fun mani. For my beach look I pulled various techniques together to create the perfect beach look. First up I started off with two coats of Alpine Snow by OPI. This is always my go to base color for gradients. 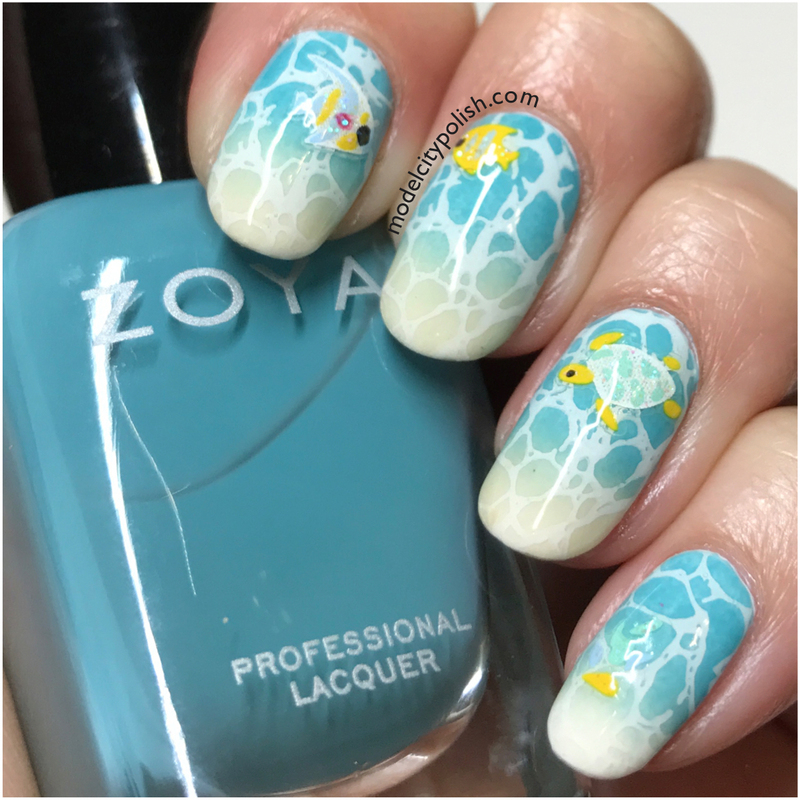 Next I used Rocky and Cala by Zoya to create my water to sand gradient look. These two blended perfectly! Now to really tie the two shades together I used white stamping polish from MoYou Nails and the Dreamology plate from Moyra. I immediately fell in love! 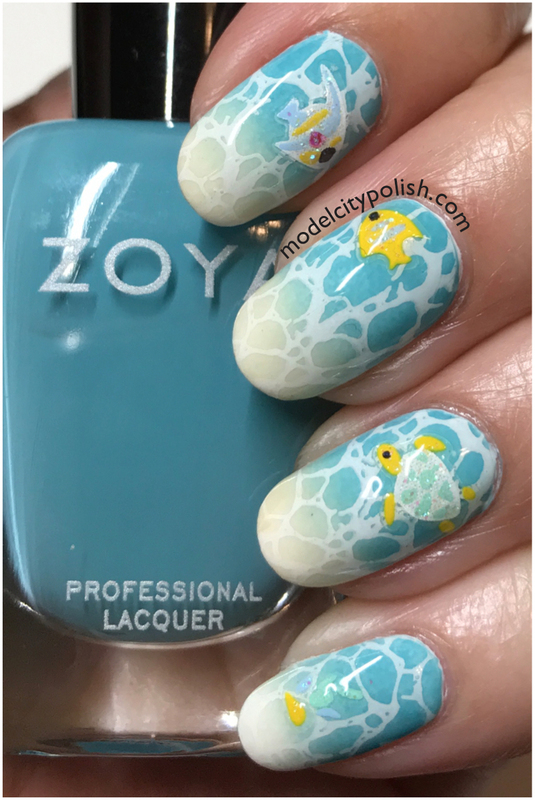 Now of course I can’t leave well enough alone and I decided to add some cute Ocean Decals from CinaPro, Lastly everything was sealed with three coats (I really needed to level things out) of Marvel Liquid Macro Top Coat by SuperChic Lacquer. Cute! Your nails look just as if I were looking into cool, blue water. I love your nail art. 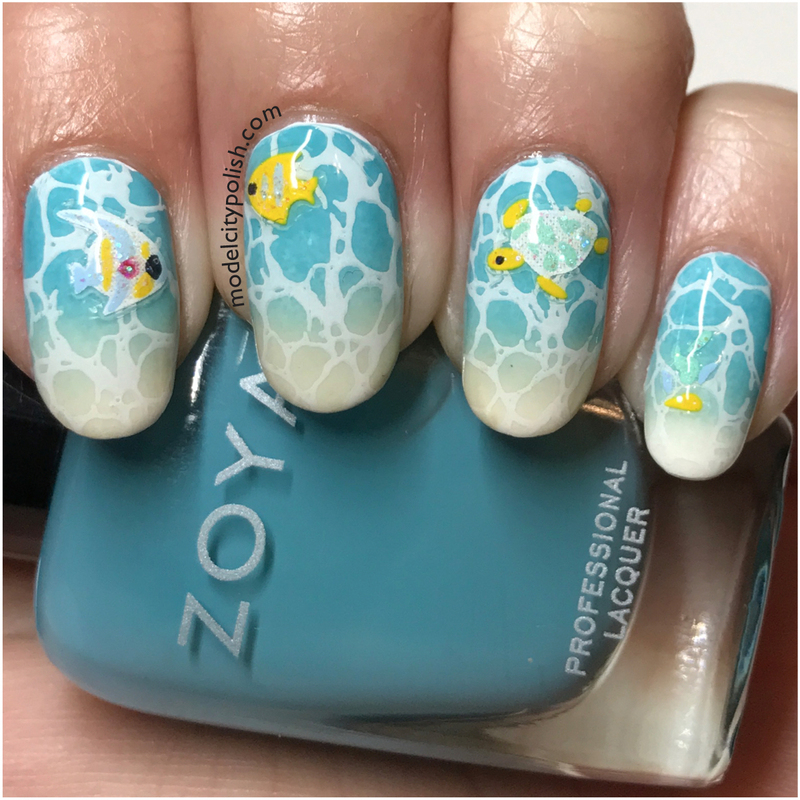 It’s just so cute to have a little fishy playing on your nails. OMG Nina! Those decals are so adorable & I love what you did to use them! Perfect mani! That is SO cute!!! I need to pick up that plate, for sure! Those decals are so stinkin’ cute!! I love how this turned out. You’ll definitely need to recreate this. You always do such gorgeous theme manis – this is no exception! Those are adorable! Love everything about them! Love this! So intricate!! Your gradients always look so smooth. 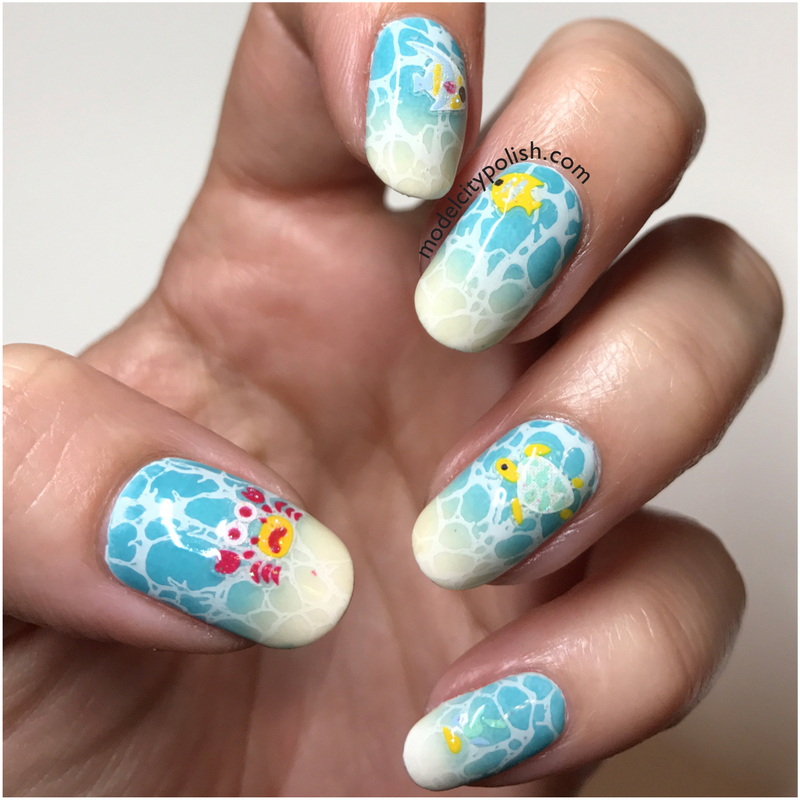 Beach nails are always fun! I haven’t done them in a while, but they will always be a favorite. OMG I absolutely love this!!! Pinning! THAT TURTLE! Beautiful mani. I can’t wait to hit the beach this summer! I have these stickers! It’s such a cute way to use them! I’ll need to pull them out. I absolutely love this. I did similar nails for my vacation last year and they were so fun!